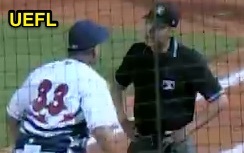 MiLB Umpire Alex Ziegler's ejection of Pensacola Manager Pat Kelly during Thursday's Southern League (AA) action is our featured Minor League Baseball ejection. 1B Umpire Alex Ziegler ejected Blue Wahoos Manager Pat Kelly for arguing an out call (reversed safe call) in the bottom of the 3rd inning of the BayBears-Blue Wahoos game. With none out and none on, Blue Wahoos batter Joe Hudson hit a 1-1 fastball from BayBears pitcher Billy Buckner on the ground to first baseman Kevin Cron, who threw to Buckner as he and Hudson arrived at first base. After an initial safe call, and an ensuing BayBears argument and umpire conference with HP Umpire Matt Winter and 3B Umpire Travis Godec, Ziegler ruled Hudson out. Replays indicate Buckner, in his attempt to tag first base with his foot, possibly grazed the top portion of the bag with his right foot ahead of Hudson's arrival, the call was irrecusable. At the time of the ejection, the BayBears were leading, 1-0. The BayBears ultimately won the contest, 3-2. Wrap: Mobile Bay Bears vs. Pensacola Blue Wahoos (SL), 6/16/16 | Video available via "Read more"